In Search of My Mother's Garden: "Le poulet de cuivre noir maran"
Recently my daughter Mary Kathryn and I took a trip to Newnan Georgia to purchase a group of "Black Copper Marans" consisting of a rooster, two hens, and two pullets ( a pullet is a female chicken less than one year of age). Black Copper Marans are one of the rarest breeds of chicken in the United States. It is a fascinating breed of laying chicken; producing one of the darkest chocolate-brown eggs known. It is one of the rarest breeds in this country due to the import ban on fowl in the US. They are quite common in France. Black Copper Marans eggs are prized by French chefs. They are also the favorite egg of James Bond. Using them for eating in the United States is almost unheard of, as they are so rare and prized. A three-egg omlet would cost more than $30. wholesale. One of the difficulties faced by breeders of the Black Copper Marans in the US is the lack of genetic diversity. Much of the breeding stock left in this country 10 years ago was of the English variety; with smooth, unfeathered legs. The French standard calls for lightly feathered legs. There are only a few breeders that have been able to produce Marans stock that comes close to the French standard. Fortunately, we are now the proud owners of the Wade Jeane line of Black Copper Marans. Below, is a picture of "Frick" our rooster, and yes he had a brother named "Frack". Adult hen, note feathering on legs. In this illustration, a standard Large White egg is used as #1. You can easily see that the Black Copper Marans standard is much larger, and has a slightly less oval (more round) shape. The French standard for bird size is also fairly large. U.S. genetics have some catching up to do. The French standard calls for an 8 lb rooster and a 6.5 lb hen. That’s a pretty big bird. This would probably be best accomplished with keeping the largest roosters on your hens, but not worrying about hen size unless it is visibly smaller than her mates. We are very excited about our new "flock". Mary Kathryn has had chickens for about a year and a half and has really done her homework on the raising and caring of chickens. She raised a dozen mixed breed chicks from three days old to maturity. Half turned out to be roosters and were placed in other homes. Her hens have laid consistently for the past year and the eggs are really delicious. The Marans are not laying at the current time since they have just finished molting, but should start laying again in another month or so. In the coming year we hope to start hatching some eggs and increasing our flock. We also plan to add a few Blue Copper Marans as well. On the gardening front, not much happening. I have finally stopped harvesting the okra and letting the rest go to seed for next year. I have been really happy with the "Little Lucy" variety and plan to plant more next year. I have recently installed another raised bed and using the "Lasagna " gardening process for building the raised bed. I have decided not to have a fall garden but plan to have an early spring garden next year. 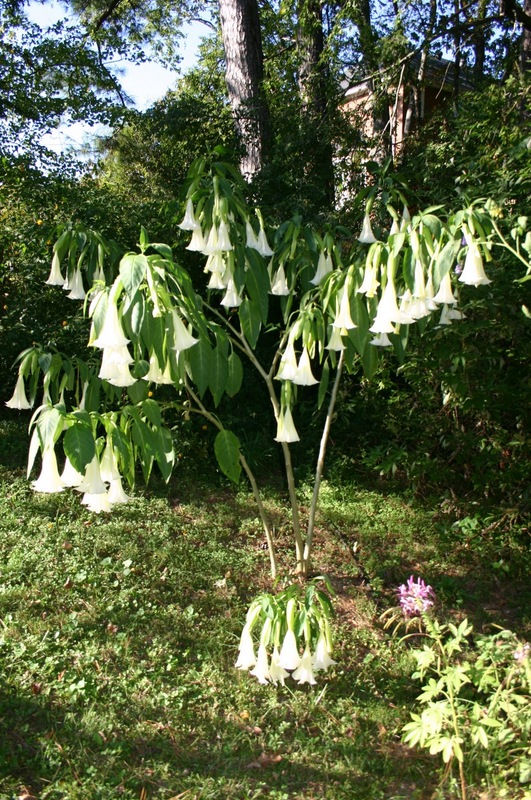 Recently I noticed my brugmansia plant was loaded with blooms. Yesterday, I took this picture in it's full glory. Also blooming is the Helianthus angustifolius or Swamp sunflower. A Narrow-leaved sunflower is a perennial to 6 ft (0.6 m) tall with a much branched stem and rough, sandpapery leaves 3-6 in (7.6-15.2 cm) long but only a half inch (1.3 cm) wide. The happy yellow flowers, 2-3 in (5.1-7.6 cm) across, are borne profusely in late summer and autumn. Rays are golden yellow and discs are reddish brown or purplish. 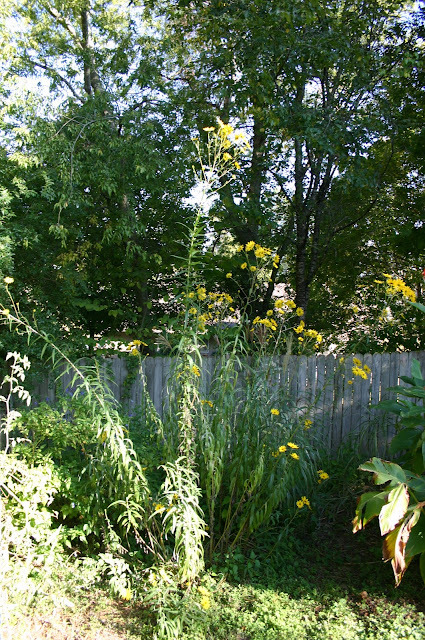 While most of these plants are typically 4-6 feet tall. I did have one that is approximately 10 feet. Swamp sunflower with Black and Blue Salvia and Cosmopolitan ornamental grass. The knockout roses are in full bloom again along with the plumbago. Finally, I found this little guy at the mail box the other day. I haven't seen a praying mantis in years until this year and have seen two this summer. They are truly unique creatures. That is so cool, I would love to have chickens. I didn't know that about the egg size. That is amazing. Hi Phillip, You should check your local ordiances and see if they allow chickens in your neighbor. If you decide at some point you want to take the leap, we should have some chicks available, just let me know if you are interested. Would love to have Chickens but there are too many Foxes and Mink in this area...as we unhappily discovered. The Maran Hens I have had in the past were black and white...sort of speckled. They laid nice big eggs too...not as dark brown as those ones though. I hate that you are unable to keep chickens. We are very excited with the Marans and hopefully we will have more in the near future. I am jealous of your honey bees. I would love to have a hive. I really enjoy your blog. Ireland is such a beautiful country. I would love to visit one day.